Ultra eBook Reader is $20 Off! *PLUS, If you buy Ultra eBook Reader (Single PC License) TODAY, we will give you a FREE upgrade to Ultra eBook Reader (Family Pack for up to 3 PCs) so that you can share this amazing software with friends and family. 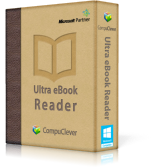 Ultra eBook Reader - Get the Ultimate PC Reading Experience.